TBDE was in attendance at Manuela at Hauser & Wirth in Los Angeles, for the launch of the new BERTOUX, a new premium brandy from California. Blended by a first-of-its-kind collaboration between The NoMad’s sommelier Thomas Pastuszak and PDT’s bartender Jeff Bell, BERTOUX is a new style of mixology-friendly Brandy. With a star studded bartending lineup, which included the likes of Yael Vengroff and Christine Wiseman, guests were in invited to enjoy artisanally crafted recipes featuring the grape based brandy, each highlighting the spirit’s uniqueness from a simple Pre-Prohibition classic to a pool-side sipper. This is the first time that a team this powerful and diverse has been assembled to launch a spirit. Three years in the making may seem like a long time but getting a label approved alone can take months, not to mention this is a Solera-type spirit which adds to the complexity of the distilling and aging process. At the end of the day, co-founder and wine industry vet Jeff Menashe wanted to be sure BERTOUX reflected the team’s vision for this groundbreaking spirit that is on a mission to change the order of cocktail culture. The menu assembled by LA’s best bartenders included the classic brandy 101 choice, the Sidecar, which is anything but simple given the spirit’s complexity and oaky finish. The result was a one of a kind nose-to-palate experience, worth having an entire different conversation about the category. Aaron and Christine’s cocktails' didn’t disappoint either, flashing combinations with a variety of ingredients, ranging from pandam extract to Japanese apricots and five-spice. At the end of the night, the most extravagant choice had to be the You Fancy cocktail, by Spare Room’s Yael Vengroff which featured Spiced Pineapple, mole bitters, Champagne and notes of cardamon, perhaps bartender’s single most difficult ingredient not to overdo. Overall, every creation we tasted proved to be a great way to explore the category without simply sipping at it first (which we highly recommend as BERTOUX is truly one of a kind in the vast and diverse brandy category). Jeff Menashe doesn’t hide his excitement about the state of our industry, especially after seeing what Los Angeles has experienced in terms of a cocktail industry growth and boom: “It’s an exciting time to be a cocktail lover in Southern California and we feel BERTOUX can be a huge player in this revolution”. We are certainly hoping so and cannot wait to see where this story will end. BERTOUX Brandy is a new premium brandy from California that is expertly blended and balanced to elevate the craft of cocktails. It is a Solera-style blend of pot-distilled California fine brandies aged 3 to 7 years in French and American oak. 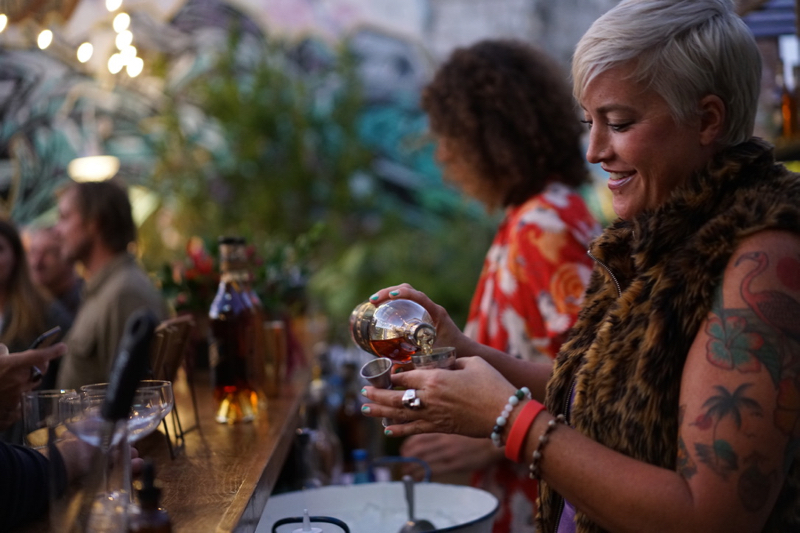 Designed for mixology, BERTOUX Brandy was blended by a first-of-its-kind collaboration between renowned bartender Jeff Bell (PDT and Legacy Records) and acclaimed sommelier Thomas Pastuszak (The NoMad). It seeks to restore brandy’s marquee role as a cocktail base, which it enjoyed in the mid-19th century’s Golden Age of the Cocktail. BERTOUX Brandy is part of a group of premium brandy producers in California that is making a concerted effort to establish new and elevated standards for the category. BERTOUX Brandy is led by Jeff Menashe, a wine and spirits entrepreneur, in partnership with Jeff O’Neill, a respected California wine and spirits producer. For more information, please visit www.bertouxbrandy.com and follow them Instagram at @BertouxBrandy.